Just like cleaning your oven, there are a number of reasons as to why you need to keep on top of aga cleaning. Not only is a dirty aga unhygienic, but it can be hazardous too – spilt food often produces an unpleasant smell and the taste of charcoal, which can sometimes smoke and turn into a fire. Furthermore, a build-up of residue in your aga can also clog the mechanisms in the oven, making it less efficient at reaching higher temperatures. We’ve put together some aga cleaning tips on how to clean your aga and keeping it looking clean. A top aga cleaning tip for maintaining a clean aga is to mop up any spills immediately with a damp, soapy cloth, particularly with acidic products such as orange juice as this causes stains. Due to the aga top being hot, spills can often become baked on if they’re not mopped up straight away and may need to be scraped in order to be removed, meaning that you could scratch the enamel. After you have wiped the spills with a cloth, buff the surface with a dry cloth. The chromed lids can also be cleaned in the same way or polished using a stainless-steel polish. Carrying out this aga cleaning tip every day should be enough to keep it looking clean. However, every 6-12 months (depending on usage) your aga will be in need of a deep clean to remove the accumulated fat and grease, which can be achieved with a professional aga clean or aga cleaning products. AGA specifies that only recommended cleaning products should be used on their ovens as approved by The Vitreous Enamel Association (VEA), this is because the vitreous enamel surface requires special care when cleaning. The good news is that our Ovenclean specialists are fully trained in cleaning agas and use a unique range of no added caustic-soda cleaning products for aga cleaning. 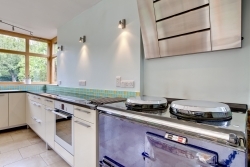 We will restore your cooker, whilst also working to protect and enhance its enamel finish. Something to remember when cleaning your aga is to make sure you clean the oven doors, Usually, the doors can be lifted off an aga so you are able to clean them more easily. Simply wipe the doors down with a damp soapy sponge, and this will prevent the build-up of food and grease. 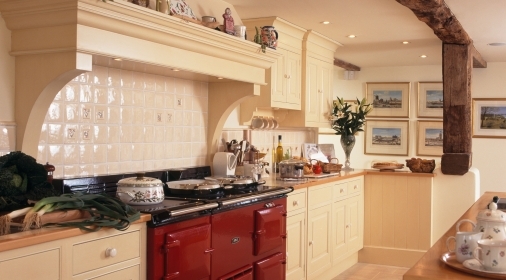 When cleaning your aga oven you must make sure that the oven is completely cool, then use a wire brush on the cast-iron components in order to remove stubborn stains. If you are still finding baked-on stains difficult to remove after completing this step, then just go over the grates with a damp sponge and some warm, soapy water. Take a look at our blog on how to clean an oven, as many of these pointers can be utilised for aga cleaning tips. If you wish to use cleaning products on your aga, before cleaning your aga remember to check that The Vitreous Enamel Association (VEA) approve the product that you wish to use. Alternatively, if you want less stress and bother, call Ovenclean! All of our cleaning products are approved, completely safe and eco-friendly, so you can count on us to revitalise your aga! Did you know that cleaning the oven is the most hated household chore? Keep on top of it with the aga cleaning tips above, call us on 0800 840 7127 or complete our online form for your free quote. Time to Deep Clean Your Aga?